I have been complaining about Firefox chewing up memory or ram recently. Somewhere around Firefox 3.5x or 3.6x memory consumption or usage got noticeably worse than previous version. The same is true with the new Firefox 4x version. I would say even worse than any previous version, and definitely noticeable if you are a power user like myself. I have been trying to tweak Firefox 4 so it won't use as much memory, but I haven't been having much luck with reducing it. 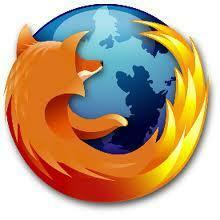 I am hoping one of these days the Mozilla people will do something about it. But, that doesn't seem like it will be happening any time soon. As I have mentioned in the past they have a tendency to blame the memory problem on addons and plugins you might have installed. I have also read that things like flash players once closed are supposed to return and free up the memory they were using. For some reason with Firefox there is a problem with this, at least that is what some are suggesting. I don't seem to notice a problem with Internet Explorer 9. Any way I recently came across this page over at Mozilla that lists several Firefox addons/extensions that can slow things down. It doesn't specifically say in terms of memory. It just says they can slow Firefox down. The page mentions 9 addons and you can select your operating system near the top. I have selected Windows 7 and you can see the #1 addon can slow Firefox by 223%. 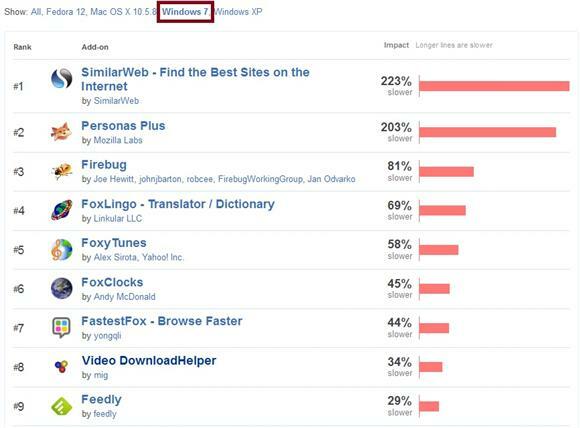 The popular Firebug addon is #3 at 81% slower. Most of the plugins on the list I do not use with the exception of Firebug which I keep disabled until I need to use it. The page seems to only list extension addons and not plugin addons. It would be nice if they included plugin addons too for comparison. Which would include things like Adobe Acrobat, Java, Shockwave, Silverlight, etc.